The other day I found an old felt puppet in a remote shop. It was hand stitched and well loved and of course got me into the felt crafting mood. 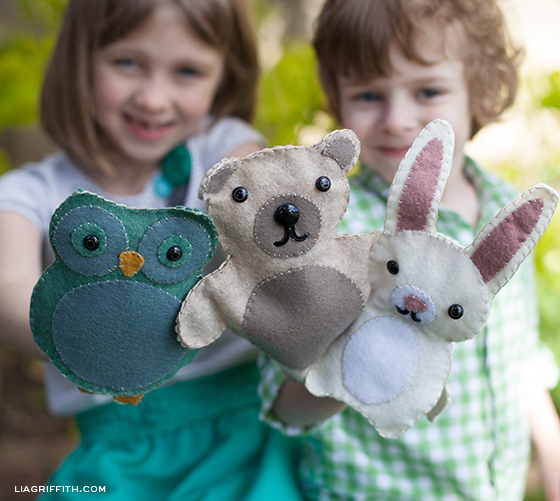 I decided to make these felt puppets using three of my woodland animal characters. Oh what fun! So much fun that I do believe there will be more sewing projects and tutorials in the near future. 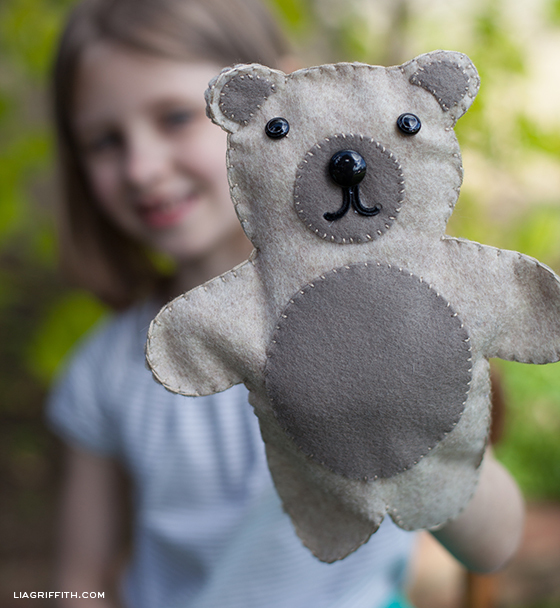 There are so many different uses for these cute little characters, but these puppets would be especially great at a woodland animal themed birthday party! I love these puppets and would like to make them for my baby. Where did you get the button eyes? What are they called exactly? I love how they look kind of “real” — almost like pupils! Thank you! These were found at my local fabric store just sold as buttons. Thank you for sharing. I need to help my daughter make one as a school project… And now with you easy instructions, I can. Thank a ton. That is great to hear Melanie! 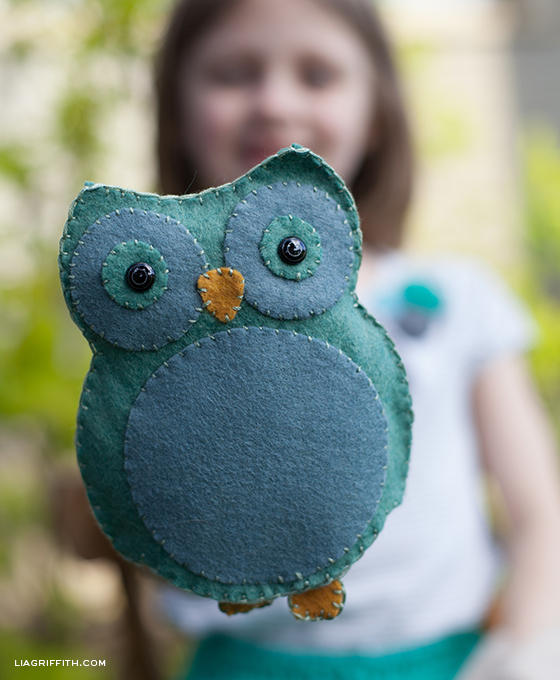 Your woodland critter puppets are so darned cute, saw comment one person left about making a mobile of them, great idea. Will see how many uses for them I can think up. I love working with felt, making whatever I can. I’m a paper crafter but love using many other mediums. Thanks! I am wanting to get a fox designed next to add to the set. Coming soon! Very sweet! Love that idea. Hi Lia! I just wanted to let you know I love these critters! I actually used the pattern as the basic shape for a baby mobile’s dangly bits. I wanted to know if it’s alright with you if I post a mention of this pattern and a link to this page on my blog about making the mobile? Yes, yes!! Send me a link too, I want to see your finished mobile. It sounds adorable. Here you go! Hope you like it! How adorable Erin! Thanks for sharing! Thanks Becky!! Love your blog! 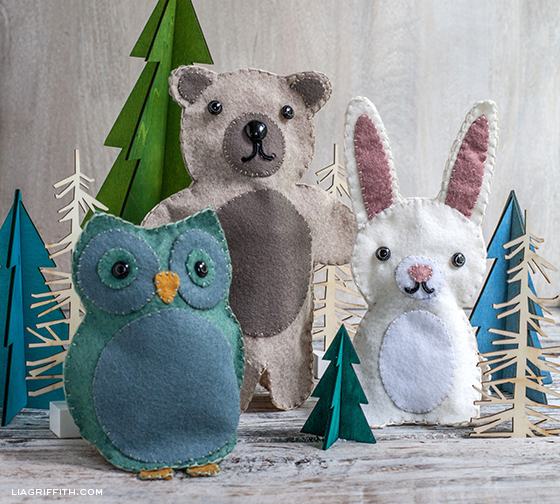 Your ” Woodland Friends DIY Felt Puppets” are adorable! Every year we have children’s summer camp which includes gardening, performing arts, arts and crafts, with children ranging 7 years and up. This year’s theme is storytelling. We would love to include your 3 adorable animals for our young campers to create for their very own. We will most definitely give you credit for your adorable creations. Absolutely! That totally warms my heart! Thank you very much! That was an awesome HELP for the kindergarden project! These are so gorgeous! I’m going to be trying this very soon. May I ask where you purchased the beautiful felt? This is a heathered wool felt that I picked up at the local fabric store, but I am finding great option for gorgeous felt on Etsy too. You are so welcome Claire! These are adorable! I can’t wait to make them for my sweet baby. Thanks for the pattern! First time on your blog and love it! 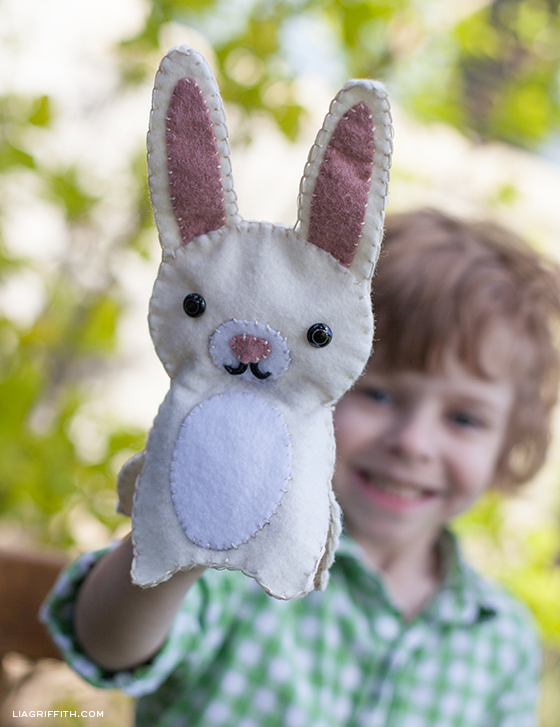 Saw the puppets in Made in Felt magazine and I will be making the rabbit and the teddy bear for my husbands grandchildren for Christmas. Thanks Julia! I will check it out right now. What?! Did you make the forest of trees for your photo shoot, too? Hahaha – so adorable! I want a set just for our “grown-up” parties. ~M. Oh !! gràcies per els patrons , és genial , estan molt bonics per regalar a una criatura i no sembla difícil. Ets un encant !! These are so adorable! Again, such great presentation. Thanks! Thanks Lisa! I have fun shooting. . . can you tell? thank you for the templates, my boys will love making these puppets. Thanks so much for your generosity. I am amazed at the wonderful things you share. Yay! I’m just giddy seeing my darling kiddos on the screen! You got some precious shots. They are already asking when they can do it again. 😉 I seriously need to take a photography class so I can capture them like you do. They were so fun to work with. I will give you some tips and tricks that I have gathered on shooting too.